Let’s put the boots (flip flops?) 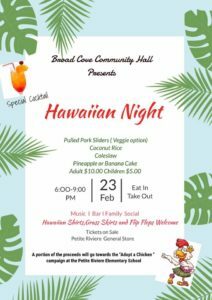 to winter as we dust off our loudest floral shirts, our leis and our grass skirts at this family-friendly Hawaiian social. There will be Hawaiian music, decor, and food (pulled pork sliders (with a vegetarian option), coconut rice, cole slaw, banana or pineapple cake). Adults $10, kids five and over $5, and those under five free. Cash bar (including a special Hawaiian cocktail.) A portion of the revenue will be donated to the Adopt a Chicken campaign at Petite Riviere Elementary School. Tickets available at Petite General Store. A variety of plants and some shrubs will be available to help beautify your landscape.